Last year, Dave Chapman (designer of Cubicle 7’s Doctor Who Roleplaying Game) hosted a month-long series of writing prompts about roleplaying games called #RPGaDAY. He’s back again this year with another month’s worth of prompts to celebrate “everything cool, memorable, and amazing about our hobby.” I’m planning on participating again, but over here on my website instead of G+ this year. (This is also a sneaky way of prompting me to update my website.) Along with these 2015 posts, I’ll be revisiting last year’s posts. Sorry, but I just had to change it from that horrible pink color. Click through if you want to grab the color-shifted fullsized image. There are three games that I’m very interested in, but I think I’d only ever get one to the table. The two that I probably won’t be able to play are Apocalypse World, 2nd Edition and Unknown Armies, 3rd Edition. The third one is the Sentinels Comics RPG. Unknown Armies is a game I’ve always wanted to play but never did. Again, lack of a regular gaming group will keep me from playing this, I think. Second Edition, I had a copy of and every so often I go back to read the fiction in the game and think about street-level games that never came to pass. I do have 3rd’s playtest files and a small group that might tackle it. So, who knows? That may turn into something. 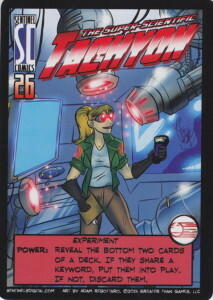 But I’m probably going to be able to play through the Sentinels Comics RPG, based on the Sentinels of the Multiverse card game (and related properties). The young girl likes superheroes, but we need a fast and easy game to play that I could use to introduce her to actual heroic stuff. Something a bit more complicated than RPG Kids, but nothing as complex as pretty much every other Supers RPG out there. The team on Sentinels is mostly the same group as on Marvel Heroic, which is super fast and easy, but might be conceptually a bit over the 9yo’s head. I haven’t seen Sentinels yet, but I know Cam’s work1 and I like his stuff. I think the girl will, too. However, if Sentinels doesn’t work out, we might have to go with some sort of ICONS/Fate mashup.